If there’s a modern contemporary to the late motorcycle daredevil Evel Knievel, it’s Travis Pastrana. So it’s fitting that Pastrana will attempt to recreate — and surpass — three of Knievel’s jumps live on the History Channel Sunday. He’ll do it on Indian’s Scout FTR750, a 375-pound modern dirt-track racer closer to Knievel’s chrome-and-steel-era machines than Pastrana’s lighter motocross jumper. He’ll also pay full homage to Knievel by donning Captain America-inspired retro gear, including a cape. Travis Pastrana will wear a retro 1970s suit while recreating Evel Knievel's jumps. Nitro Circus photo. After pioneering the first double motorcycle backflip — and the sport of freestyle motocross — there’s not a lot that daunts Travis. “But doing this on the heavier Indian, in high heel dress boots like Evel wore, and catching a shift off the ramp is going to be pretty difficult,” Pastrana told me on a call. Of Knievel’s 75-plus ramp-to-ramp career jumps, Travis looks to surpass Evel’s 1973 L.A. Coliseum leap over 50 crushed cars by clearing 52. He’ll recreate Knievel's 1975 hop over 14 Greyhound buses by upping the number to 16. And Pastrana will attempt one of Knievel’s most famous jumps: his unsuccessful flight over the Caesars Palace fountains, where EK cleared the 141-foot span, but crashed on the landing within an inch of his life. Knievel’s son Robbie completed the jump successfully on a Honda CR500 in 1989. The Indian FTR750 has dominated American Flat Track racing since it was introduced. Now, we'll see how well it flies. Indian photo. Pastrana’s been prepping with both his Suzuki RMZ-500 and the FTR750. Now 40-plus years past Knievel’s jumps, you’d think Pastrana would have an algorithmic app to plot it all out, from clutch drop to touchdown. Not exactly. Like Knievel, he’ll rely on a lot of good ol’ seat of his leathers experience. 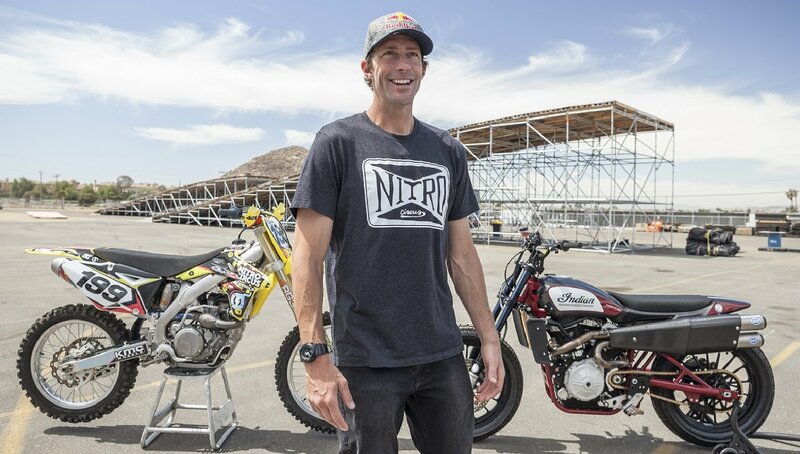 “I don’t like using computer analysis because… having those stats in your head doesn’t compare to repetition and years and years of the Red Bull stuff, the Nitro stuff, and a lot… that has gone wrong, but should have gone right on paper,” he said, referring to his Red Bull X-Fighters titles and ongoing Nitro Circus stunt series. “You work with all that, and make the best of it,” said Pastrana. And which jump does he think will be most challenging? With only 199 feet to get up to his speed to jump the Caesars Palace fountains, Pastrana will use a “Road Runner” start to get into second gear faster. Nitro Circus photo. After all the preparation, when he finds himself on the bike right before the jumps, “the biggest thing is knowing what your marks are, and being able to execute them on the exact moment,” Pastrana told me. He noted that even a couple miles per hour over or under where he needs to be could throw everything off to disastrous consequences. His predecessor demonstrated that at Caesars Palace in 1967, when he came up short on the landing, catapulted into the pavement and fractured a lot body parts. Pastrana has broken his fair share of bones, too, but that’s not the only thing he shares in common with Knievel. In their respective eras, there are probably no two people who have done more to bring showman, stunt motorcycling to the masses. Knievel is often framed as a renegade daredevil, but we shouldn’t overlook Knievel the headstrong businessman, who brought motorcycles into the mainstream in a way that wasn’t Hells Angels or biker gangs. Though Knievel wasn’t aware of it at the time, his primetime TV specials paved the way for Pastrana and sponsored extreme sports programming long before the X-Games, cable, YouTube, or VOD. Travis gets that. Pastrana credits Evel Knievel for paving the way for his motorcycle jumping career, in Nitro Circus and elsewhere. Nitro Circus photo. “I wouldn’t be making a career in jumping motorcycles if it wasn’t for Evel Knievel,” he said. He’s definitely carried the torch into a new era in multiple ways with his Nitro Circus. The stadium show performs in 23 countries on four continents and choreographs motorcycle stunts Knievel couldn't have imagined. For Pastrana, who recalls watching "On Any Sunday" with his dad, the “Evel Live” show is about connecting two different generations of motorcycle culture. “This is an opportunity to bridge this gap between my dad and my uncles, who love Evel Knievel and everything from the past... and up-and-coming kids who probably don’t even know who Evel Knievel was,” he said. “Evel Knievel… and "On Any Sunday" are the two reasons why my dad and his brothers had motorcycles and got into riding, because of that cultural influence.” And because they rode, Travis learned to ride as a boy.